It seems that Report and its piece about, or I would say, against the Neapolitan pizza left a permanent mark in the minds and the hearts of everyone, in those who get their hands dirty with water and flour for profession, those who do it for fun and passion and those who, with words and photos, live and keep that world and its protagonists alive, drawing its profile. After the service broadcasting, as the title of a famous film recalls, the day after tomorrow arrived, for someone dark and gloomy. What is certain is that the episode of the popular television program was a turning point, drawing the indelible boundary between before and after, a particular way to act and the resolute will to show that there is also a different way to work and that, as usual, all generalisations are dangerous and wrong as they cause confusion. The name of that movie inspired “Olive oil: The Day After Report”, the event that on March 2 gathered professionals, journalists and pizza lovers to know more about one of the most important products of Italian agri-food sector, the extra virgin olive oil, and about how important it is when making the Neapolitan pizza. Arranged by Enzo Coccia in cooperation with Riccardo Scarpellini, virgin oil chooser, Gino Celletti, one of the greatest specialist on the subject and Laura Gambacorta, food journalist, the happening, unavoidable continuation of the initiatives organised to shed light on the issues raised by Rai 3 program, was divided into two sessions: the meeting in the morning with experts and producers, which led the guests through a tasting path, was followed by an evening dazzled by five different pizzas topped by just as many oils from Campania. A day, therefore, entirely dedicated to the precious ingredient. The first at La Notizia microphone was Dr. Maria Luisa Ambrosino, panel leader from the Faculty of Agriculture, University of Naples Federico II, which, reflecting on 2014 critical situation, a black year for olive oil (and not only), emphasised on quality, the cost to pay for it, how to recognise it – as reading the label, checking the origin and, when possible, tasting the unctuous dressing – and the complexity of our region field that can boast 5 Pdo. Prof. Raffaele Sacchi, head of the Unit of Food Science and Technology at the same University, giving his personal experience, talked about the burning problem of low quality oil, often sunflower oil, which some pizzerias continue to use, while Gino Celletti, one of the greatest experts of extra virgin olive oils, commended the Campania’s oils and their producers, he considered authentic excellence, the best of the Italian boot. Celletti participated in Report filming and explained that the authors’ objective was to attack the enemies of quality, certainly not a job that generates wealth and feeds a very substantial number of families both in our Country and abroad. 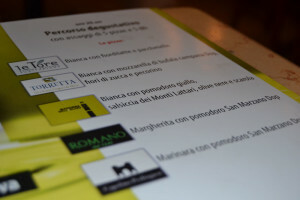 There were tasted the oils of Torretta, Romano, Madonna dell’Olivo, Capolino Perlingieri and Le Tore producers. At nightfall the five olive oils stuffed Coccia’s pizzas: three white pizzas, one with fiordilatte and pacchetelle tomatoes, one with buffalo mozzarella Pdo, zucchini flowers and pecorino cheese and another with yellow tomatoes, sausage from Monti Lattari, black olives and escarole, one margherita and one marinara, both with San Marzano tomato Pdo. Gatherings like this one are useful to teach and guide us in the oil choice to be finally able to distinguish the good from the bad oil, as Prof. Sacchi’s son, which, weaned with baby food flavored with high quality oil, only 2 years old, identified the awful oil used to stuff his pizza.